This updated and expanded edition of the bestselling textbook provides a comprehensive introduction to the methods and theory of nonlinear finite element analysis. New material provides a concise introduction to some of the cutting-edge methods that have evolved in recent years in the field of nonlinear finite element modeling, and includes the eXtended finite element method (XFEM), multiresolution continuum theory for multiscale microstructures, and dislocation-density-based crystalline plasticity. 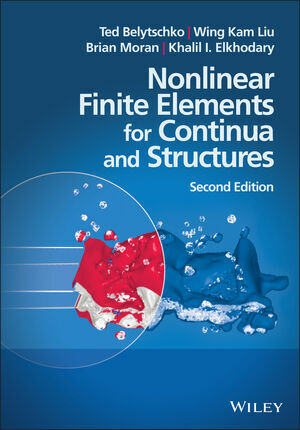 Nonlinear Finite Elements for Continua and Structures, Second Edition focuses on the formulation and solution of discrete equations for various classes of problems that are of principal interest in applications to solid and structural mechanics. Topics covered include the discretization by finite elements of continua in one dimension and in multi-dimensions; the formulation of constitutive equations for nonlinear materials and large deformations; procedures for the solution of the discrete equations, including considerations of both numerical and multiscale physical instabilities; and the treatment of structural and contact-impact problems. Ted Belytschko is a Walter P. Murphy Professor and McCormick Distinguished Professor of Computational Mechanics at Northwestern University. His main research interest is in computational methods for modeling the behavior of solids, with particular emphasis on failure and fracture. He is currently the Editor-in-Chief of the International Journal for Numerical Methods in Engineering. Wing Kam Liu is a Walter P. Murphy Professor in the Department of Mechanical Engineering at Northwestern University. His main areas of research include nonlinear finite elements, multiscale methods for materials design and engineering simulation. Brian Moran is a Professor in the Department of Mechanical Engineering at Northwestern University. His research interests include computational methods, continuum and fracture mechanics, micromechanics and composites. Khalil I. Elkhodary is a post-doctoral researcher in the Department of Mechanical Engineering at Northwestern University. His research interests focus on theoretical and applied mechanics.